We’d love your help. 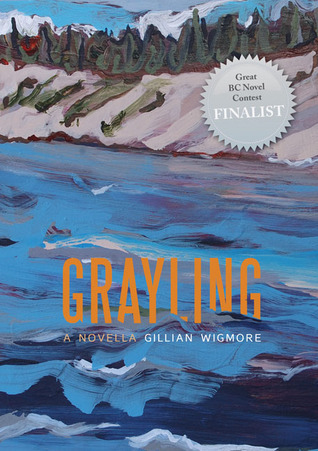 Let us know what’s wrong with this preview of Grayling by Gillian Wigmore.
" . . . a spirited journey story I found as irresistible as the powerful river that carries us through the beautiful and treacherous northern landscape. "– Jack Hodgins author of, The Master of Happy Endings, Broken Ground, A Passion For Narrative. After surviving a health crisis, Jay heads to the remote and challenging Dease River in Northwestern BC for a two week canoe and " . . . a spirited journey story I found as irresistible as the powerful river that carries us through the beautiful and treacherous northern landscape. "– Jack Hodgins author of, The Master of Happy Endings, Broken Ground, A Passion For Narrative. To ask other readers questions about Grayling, please sign up. This is a wonderful novella. As I have been paid to write a review of it for the summer issue of BC Bookworld, which has not appeared yet, I won't do a review here. Suffice to say, I do highly recommend it. Wonderfully evokes the wildness of the Dease River, and the tension between the two characters keeps the novella humming along. Both characters (especially the woman) remain mysterious to us in many ways, but we learn enough that the eerie ending resonates. It's an interesting read, and a short one. The novella is only 112 pages long and I polished it off in one afternoon a rainy afternoon sitting by the fireplace in my home in Vancouver. I love almost any story that involves a canoe trip down a river, and this one was no exception. But because it's fiction there are some very macabre elements to the story. It's about a couple's trip down the Dease River in northwestern British Columbia – but the woman in the story joins the man partway into his jou It's an interesting read, and a short one. The novella is only 112 pages long and I polished it off in one afternoon a rainy afternoon sitting by the fireplace in my home in Vancouver. Wonderful evocation of the northern landscape - a moody, yet swift-moving novella. I know a lot of people who read it this summer, but I'd recommend it as the perfect autumn read. A touching novella on canoeing, loneliness, and the intimacy of telling a story to a stranger. Brilliant debut makes your sixth sense hum. You can reread it many times and still be amazed. Gillian's prose sings throughout this novella, and the visceral descriptions made me feel as though I was sitting in the canoe alongside the characters. Wonderful work!